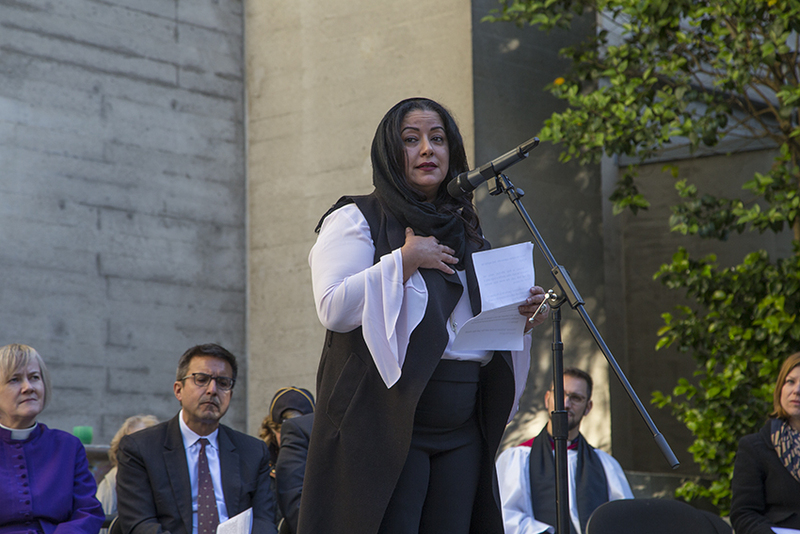 Hala Hijazi from the San Francisco Human Rights Council reads from the Quran at a vigil held in Grace Cathedral. Photo by Abraham Rodriguez. Last night at Grace Cathedral, a coalition of San Francisco faith leaders held a vigil for the child immigrants torn from their parents at the border, drawing a crowd of some 200 supporters. The vigil was motivated by growing national opposition to the Trump Administration policies that shunt immigrant children away from their families and into prison-like conditions. Organized by the San Francisco Interfaith Council, speakers from six different faith traditions read passages from holy texts and poems in support of immigrants. Leaders of the Christian, Muslim, Jewish, Buddhist, Hindu and Baha’I faiths took turns speaking. Rabbi Jason Rodich of Congregation Emanu-El, the city’s largest synagogue, read a blessing for children, followed by a portion of “The New Colossus” written by Emma Lazarus and recited by Abby Michelson Porth of the Jewish Community Relations Council. Lindsi Kimizuka, who is from the Buddhist Church of San Francisco, broke down in tears while she spoke to the crowd as she shared that her own family had been in Japanese internment camps during World War II — and expressed fear for her two-year-old daughter, who is half Mexican. Reverend Canon Dr. Ellen Clark King, Grace Cathedral’s executive pastor, said all of the faith groups work together “all the time” and that it is easier now than it was 25 years ago. “It’s tragic to see America, where I am an immigrant myself, losing its vision of welcoming the world into its borders,” said King, a Canadian. Michael Pappas, the Executive Director of the San Francisco Interfaith Council, said that people are growing dangerously numb due the barrage of negative news from Washington, D.C. He added that every member of the council has wanted to do something about the child separation policy, and organizing the vigil was a simple matter of “calling friends.” He recalled how, in the past, movements that led to great change were led by faith leaders. “We show our faith through our work,” Pappas said. Among the attendees of Thursday’s vigil were a few members of the Catholic Charities, and immigrant activists like Jose Cartagena. Cartagena came to the U.S. to escape the civil war in El Salvador and risked his life during the journey. Not all of his fellow migrants survived while crossing the southwestern deserts. “I came here when I was 17 and had the same experience as the kids today,” Cartagena said. For that reason, he said, he wants to lend as much support as he can to the newcomers and join movements that can demand positive change that will treat people humanely and end mistreatment of immigrants. Pappas said a number of the congregations of the city’s Interfaith Council plan to travel to the U.S.-Mexico border this weekend, joining demonstrations and lend their support. “We’re going to continue do our work and hold our civic leaders responsible,” he said. Were there no Roman Catholic priests or anyone form the Archdiocise speaking?